OCEAN DEMO: "The demo starts, and I’m suddenly standing on an underwater shipwreck on the ocean floor. Fish are swimming around me, and I see the shadow of a manta ray cross the boat. I look up and see a small school of manta rays swim by. I turn around again and see a giant blue whale approach the ship and slow down, just to greet me. We have a small staring contest. 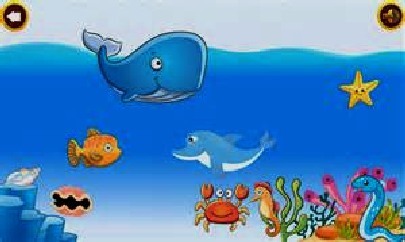 I’m pretty sure I win because the whale swims away." We all love visuals, whether an adult or child. With virtual reality you can enjoy a field trip under the sea without ever leaving the lecture hall or classroom - or putting on a wet suit. Teachers can also show things about animals and biology that you cannot convey on paper or using pictures, by taking students of all ages to those places that you cannot go to safely in real life, in virtual settings that are interactive and comfortable - even if the virtual world gets the heart pounding at times. To make it even more fun, if your audience is up for it, they can complete a mission in the face of awesome odds using the latest headsets and hand controls. The ultimate goal is to leave ocean visitors with a virtual first-hand experience and the inspiration to protect the magnificent creatures they have just befriended and maybe even saved from the menace of plastic or discarded fishing tackle. Whales, dolphins and sharks regularly become entrapped in fishing lines and nets, while turtles suffer from plastic bag strangulation, straws and beer can packaging. You can save them in virtual reality and watch them swim away, rescued from a slow and agonizing death. What makes all of this possible is the rapid advances in digital technology and computing power that was mostly developed for gaming and film making. 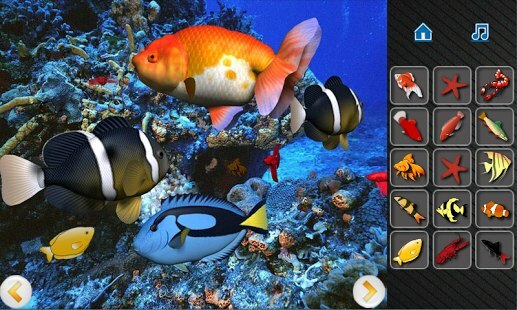 Computers have rapidly increased in power, with graphics handling capability that allows designers to create vibrant settings and sea creatures that seem real. 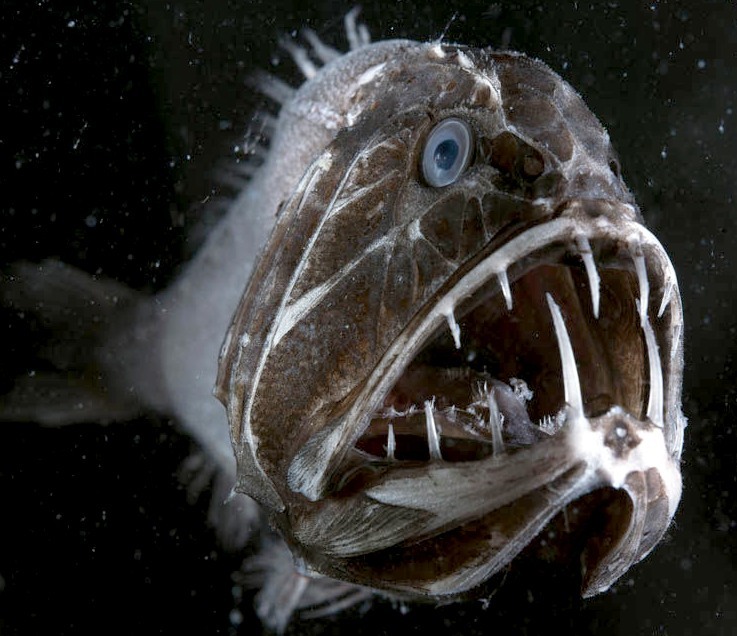 The objective for the proposed 'Virtual Ocean' is to promote awareness of the growing plastic pollution problem that the world is facing, potentially causing food insecurity, where fish stocks are dwindling due to many factors, not least of which is the toxin laden gyres which are prevalent in every ocean and sea. AFFORDABLE - Game and film making use the same software to produce backgrounds for their actors to play out their parts. The advent of headsets and hand controls with high picture quality and 3D sound means that virtual reality has virtually become a reality. The best 3D experiences are those with intriguing background themes and a storyline that appeals to audiences and perhaps makes them want to visit the sub-aqua playground again. Deciding on the type of landscape, characters and scenery elements should be to create a roadmap for all visitors to follow and ensure that their tour is rewarding and informative, maybe leaving more to be discovered. Creative visuals and artwork are a key component in creating accurate 3D worlds. Most game themes today lean towards hyper-realistic graphics. A lot of detail goes into creating characters, environments with flora and fauna, vehicles (boats and submersibles) and the nets and ropes that threaten wildlife. This includes animation skills as well. Level design for 3D games and virtual reality educational tours is a complex process. Levels need to be sufficient to allow for flexible interactive progression, yet have a definite path so that players don’t get lost. Experienced 3D development companies understand how to design immersive levels that enthrall students while taking into account important elements like navigation and possible problem solutions. Virtual reality in 3D and gaming (or interactive tasking) also involve high volumes of data such that software needs to be optimized for smooth user input and camera tracking. Models and animations need to optimized to ensure seamless transitions without lags. 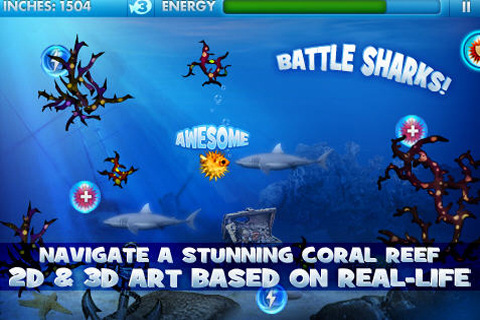 Far removed from virtual reality, a complementary phone game built for IOS and Android might be an introduction tool as players who like the marine theme work up to mid-level PC gaming and finally the 3D undersea world. Such a game may feature SeaVax cleaning up the world's polluted oceans when the fish nearby become bigger and people happier. VIVE: The HTC Vive is a virtual reality headset developed by HTC and Valve Corporation. The headset uses "room scale" tracking technology, allowing the user to move in 3D space and use motion-tracked handheld controllers to interact with the environment. 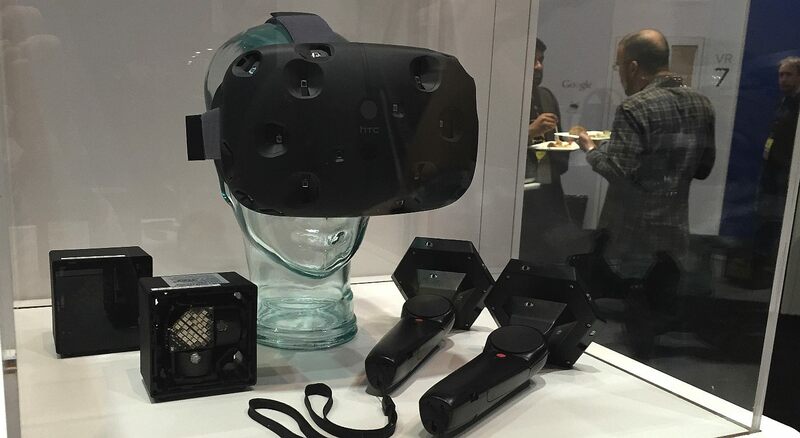 The HTC Vive was unveiled during HTC's Mobile World Congress keynote in March 2015. Development kits were sent out in August and September 2015, and the first Consumer version of the device was released on April 5th, 2016. 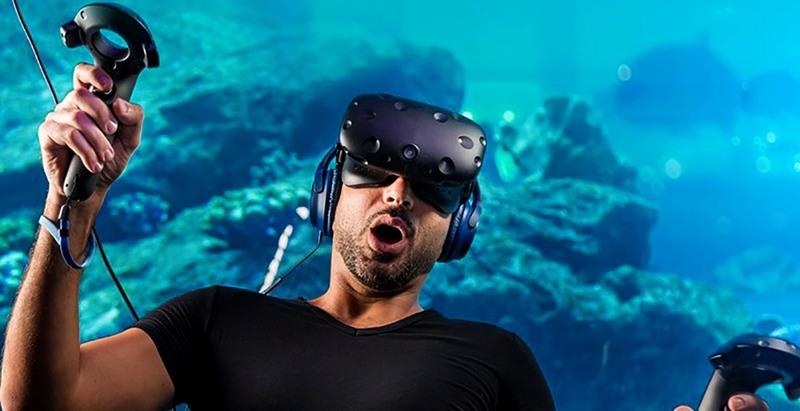 The HTC Vive was born out of a partnership with Valve, one of the most important gaming companies in the industry: Valve runs the Steam store, which is the biggest distribution platform for online games, and the company is also famous for making several critically-acclaimed games, including the “Half-Life” series. HTC, of course, makes consumer technology products, including the gorgeous HTC One smartphone line. So how does it work? While wearing the headsets, viewers are given a 360-degree encounter with the animals in their natural habitats. For added effect, a narrator will give quick facts about the animal and will also highlight the current threats to their survival. RIFT - The Oculus Rift is a virtual reality headset developed and manufactured by Oculus VR, a division of Facebook Inc., released on March 28, 2016. Oculus initiated a Kickstarter campaign in 2012 to fund the Rift's development, after being founded as an independent company two months prior. The project proved successful, raising US$2.5 million. In March 2014, Facebook purchased Oculus for $2 billion. The Rift has gone through various pre-production models since the Kickstarter campaign, around five of which were demonstrated to the public. Two of these models were shipped to backers, labelled as 'development kits'; the DK1 in mid 2013 and DK2 in mid 2014, to give developers a chance to develop content on time for the Rift's release. However, both were also purchased by a large number of enthusiasts who wished to get an early preview of the technology. The Rift has a Pentile OLED display, 1080×1200 resolution per eye, a 90 Hz refresh rate, and 110° field of view. It has integrated headphones which provide a 3D audio effect, rotational and positional tracking. The positional tracking system, called "Constellation", is performed by a USB stationary infrared sensor that is picking up light that is emitted by IR LEDs that are integrated into the head-mounted display. The sensor normally sits on the user's desk. This creates 3D space, allowing for the user to use the Rift while sitting, standing, or walking around the same room. 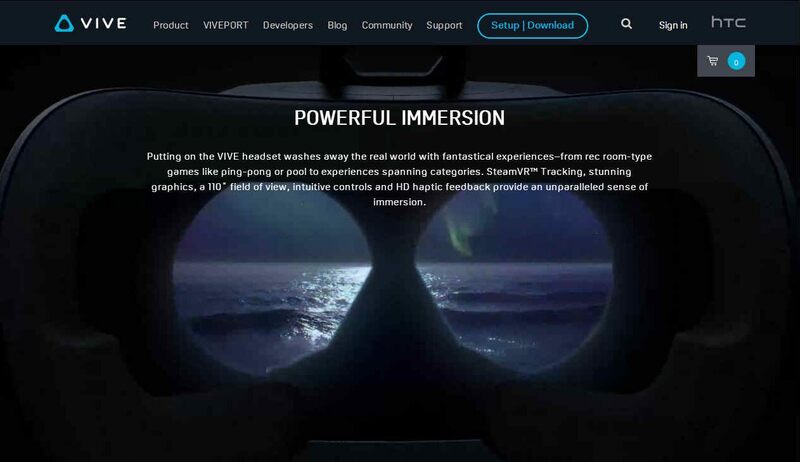 In May 2015, Oculus VR announced "recommended" hardware specifications for computers utilizing Oculus Rift, specifying a CPU equivalent to an Intel Core i5-4590, at least 16 GB of RAM, at least an AMD Radeon R9 290 or Nvidia GeForce GTX 970 graphics card, an HDMI 1.3 output, three USB 3.0 ports, and one USB 2.0 port. Oculus VR stated that these requirements would remain in force for the life of the first consumer model. The company also stated that while upcoming discrete GPUs for laptops may be able to reach the required performance for Oculus Rift, systems which switch between integrated and discrete graphics may not handle output in a manner that supports the device. Oculus Rift only supports 64-bit versions of Microsoft Windows 7 SP1 or later. UNREAL - The Unreal Engine is a game engine developed by Epic Games, first showcased in the 1998 first-person shooter game Unreal. Although primarily developed for first-person shooters, it has been successfully used in a variety of other genres, including stealth, MMORPGs, and other RPGs. With its code written in C++, the Unreal Engine features a high degree of portability and is a tool used by many game developers today. It has won several awards, including the Guinness World Records award for "most successful video game engine." 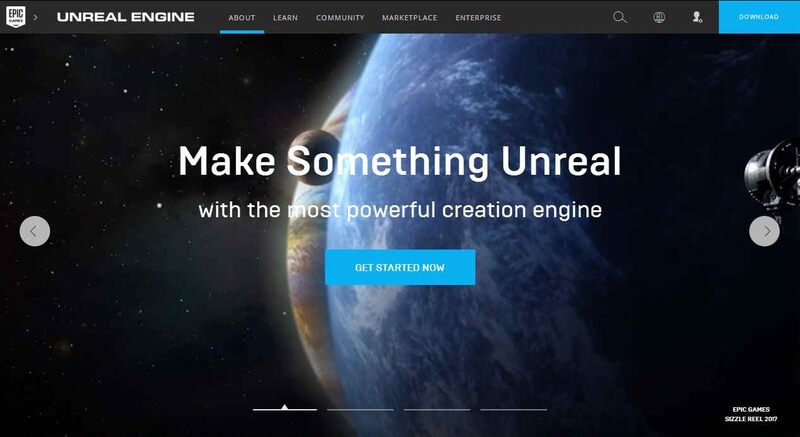 On September 3, 2014, Epic Games launched the Unreal Engine Marketplace, allowing UE4 subscribers to buy and sell community-created content of all shapes and sizes. In addition to all of the previously released free content, the new marketplace came with a variety of asset packs including full-scale environments, props, characters, sounds, materials, animated meshes, prefab C++ code and a number of other asset types as well as free demos and tutorials. On September 4, 2014, Epic released Unreal Engine 4 to schools and universities for free, including personal copies for students enrolled in accredited video game development, computer science, art, architecture, simulation, and visualization programs. On February 19, 2015, Epic launched Unreal Dev Grants, a $5 million development fund designed to provide financial grants to innovative projects being built with UE4. As of March 2, 2015, Unreal Engine 4 is available to everyone for free, along with all future updates, with a selective royalty schedule. Oculus VR announced in October 2016 that it will cover royalty fees for all Unreal Engine titles shipping on the Oculus Store for up to the first $5 million of gross revenue per game. UNITY - Unity is an multipurpose game engine that supports 2D and 3D graphics, drag and drop functionality and scripting using C#. Two other programming languages were supported: Boo, which was deprecated with the release of Unity 5 and UnityScript which started its deprecation process in August 2017 after the release of Unity 2017.1. The engine targets the following graphics APIs: Direct3D on Windows and Xbox One; OpenGL on Linux, macOS, and Windows; OpenGL ES on Android and iOS; WebGL on the web; and proprietary APIs on the video game consoles. Additionally, Unity supports the low-level APIs Metal on iOS and macOS and Vulkan on Android, Linux, and Windows, as well as Direct3D 12 on Windows and Xbox One. Within 2D games, Unity allows importation of sprites and an advanced 2D world renderer. For 3D games, Unity allows specification of texture compression and resolution settings for each platform that the game engine supports, and provides support for bump mapping, reflection mapping, parallax mapping, screen space ambient occlusion (SSAO), dynamic shadows using shadow maps, render-to-texture and full-screen post-processing effects. Unity also offers services to developers, these are: Unity Ads, Unity Analytics, Unity Certification, Unity Cloud Build, Unity Everyplay, Unity IAP, Unity Multiplayer, Unity Performance Reporting and Unity Collaborate. Unity is notable for its ability to target games for multiple platforms. The currently supported platforms are Android, Android TV, Facebook Gameroom, Fire OS, Gear VR, Google Cardboard, Google Daydream, HTC Vive, iOS, Linux, macOS, Microsoft HoloLens, Nintendo 3DS family, Nintendo Switch, Oculus Rift, PlayStation 4, PlayStation Vita, PlayStation VR, Samsung Smart TV, Tizen, tvOS, WebGL, Wii U, Windows, Windows Phone, Windows Store, and Xbox One. 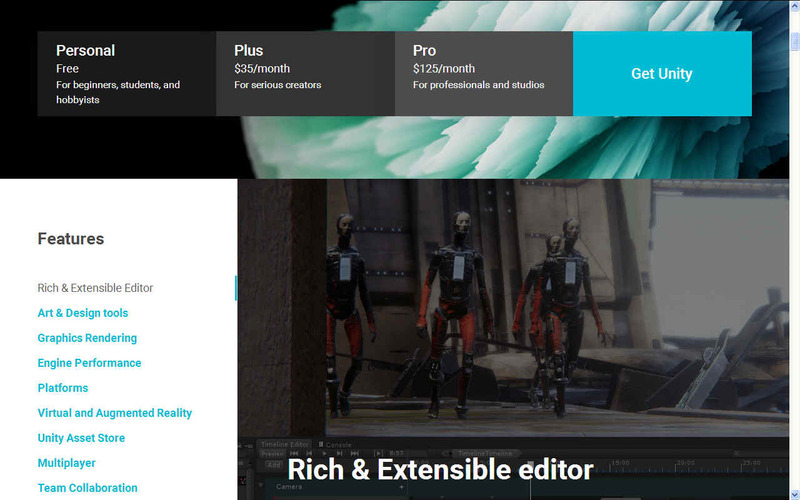 Unity formerly supported 7 other platforms including its own Unity Web Player. Unity Web Player was a browser plugin that was supported in Windows and OS X only, which has been deprecated in favor of WebGL. Unity is the default software development kit (SDK) for Nintendo's Wii U video game console platform, with a free copy included by Nintendo with each Wii U developer license. Unity Technologies calls this bundling of a third-party SDK an "industry first". Unity supports the creation of custom vertex, fragment (or pixel), tesselation, compute shaders and Unity's own surface shaders using Cg, a modified version of Microsoft's High-Level Shading Language. Vive Controllers - The wireless controllers are the hands of virtual reality, making a more immersive experience for the user. The controller has multiple input methods included a track pad, grip buttons, and a dual-stage trigger and a use per charge of about 6 hours. Across the ring of the controller are 24 infrared sensors that give the base station the location of the controller. The Steam VR Tracking system is used to increase the connection of the controller by giving wireless real time feedback of 360 degrees to the host. Vive Base Stations- Also known as the Lighthouse tracking system are two black boxes that create a 360 degree virtual space up to 15x15 foot radius. The base stations emit timed infrared pulses at 60 pulses per second that are then picked up by the headset and controllers with sub-millimeter precision. Wireless syncing lowers the amount of wires as well standard threading making the base stations practical to use in a home. The Vive initially required computers running Microsoft Windows. In February 2017, support was added for Linux, followed by support for MacOS in June 2017. INDUSTRY INSIGHT - The global Virtual Reality (VR) gaming market size was estimated at USD 4.29 Billion in 2015. Factors such as growing demand for latest technologies in electronic games by the younger generation, rising disposable income of buyers in the emerging countries, and increasing competition for developing VR technology in computerized games have boosted industry growth. 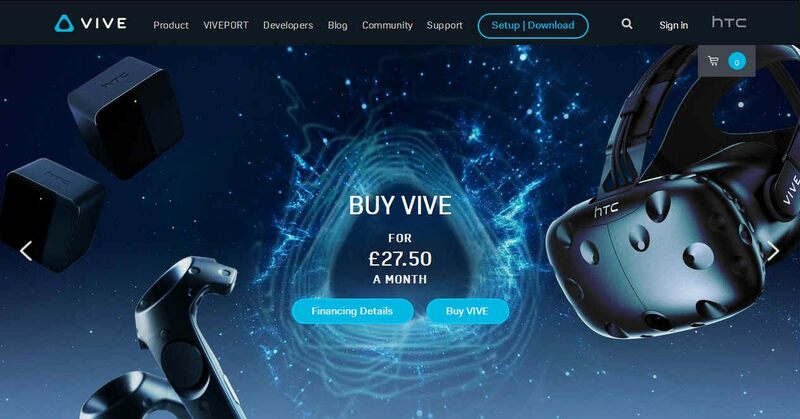 Use of crowdfunding by start-ups in the VR space to develop innovative software, accessories, and wearables is one of the most recent trends in the electronic games industry. Companies developing virtual reality devices and wearables are mostly start-ups and are using the crowdfunding platform to raise funds for VR projects. Some of the prominent industry players are Linden Labs, Electronic Arts, Facebook/ Oculus, Samsung Electronics Co. Ltd., Google Inc., HTC Corporation, Virtuix, Leap Motion Inc., Telsa Studios, Qualcomm Inc., VirZoom Inc., and Lucid VR. The companies are developing accessories ranging from motion sensing devices to arms, gloves, treadmills, and full bodysuits. Sony Corp., Microsoft Corp., and Nintendo Co. Ltd. are the key manufacturers of gaming consoles and account for a significant revenue share of the industry. The companies usually adhere to the Blue Ocean Strategy as they are the first ones to develop latest technologies. The eighth generation consoles developed by these companies are compatible with popular input devices for creating artificial simulations in games. The gaming console segment accounted for the highest revenue share in 2015 and is expected to continue being the largest device segment for adopting artificial simulation technology in electronic games. Currently, we are in the eight generation of gaming consoles with PlayStation 4, Xbox One, and Wii U steadily replacing their previous generation’s counterparts. These provide gamers with superior immersive experience as compared to desktops and smartphones. The consoles are compatible with popular Head Mounted Devices (HMDs) such as Oculus VR and HTC Vive which provide artificial simulation effect in the games. Smartphones are expected to emerge as the fastest growing devices for the adoption of the virtual reality technology in digital games, with a CAGR of around 35% during the forecast period. They provide gamers with a more cost-effective and portable solution as compared to gaming dedicated consoles and desktops. Google Cardboard headset is a head mount display which can be used with a smartphone for experiencing the virtual world of the computerized game. Use of smartphones for playing VR-enabled games is expected to emerge as a key trend in the coming years. LENOVO - The VR-ready Lenovo Legion Y920 Tower is for the most serious PC gamer. This fully-stacked machine runs on Windows 10 and houses 7th Generation Intel® Core™ i7-7700K quad-core processors designed to run the most demanding applications, from visceral first person contacts to atmospheric underwater simulators at optimum, uninterrupted speeds. The visuals are powered by up to a NVIDIA® GeForce® GTX 1080 8GB graphics card, one of the leading GPUs on the market. It offers exceptional visuals to future-proof the machine to tackle the sequels of today’s chart topping VR. The Lenovo Legion Y920 Tower has optional 32GB 2800Mhz CORSAIR® VENGEANCE® LPX overclockable DDR4 memory and optional integrated Asetek® liquid cooling to overclock your CPU. This helps with increased frame rate stability, smoother gameplay, reduced system noise and motherboard stress, so your interaction with undersea animals will be seamless.